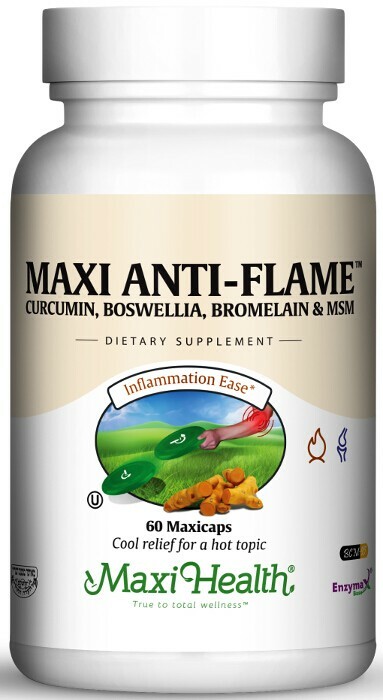 Maxi-Health® Anti-Flame is an invaluable supplement. A unique combination of herbs, it can support you in dealing with inflammation. Curcumin is a substance found in the spice turmeric. It gives support for pain relieve and inflammation. Boswellia lends support for inflammation, especially those related to aging bones and muscles. Bromelain, a derivative of the pineapple fruit, supports reduction in swelling and inflammation, as well as for pain relief from aching joints. MSM (Methylsulfonylmethane) supports joint health, range of motion, and reduces inflammation of aging joints, protecting their integrity. Try Maxi Health® Anti-Flame today! Other Ingredients: Rice flour, vegetable cellulose (capsule), vegetable magnesium stearate, Enzymax® (calcium carbonate, bromelain, papain, lipase, amylase, protease, silica). BCM95® is a registered trademark of DolCas Biotech, LLC.